Steven Spielberg is back with an historical biographical drama thriller which was written by Matt Chapman, Ethan Coen and Joel Coen. Like all Spielberg films, great detail is provided with set decoration, costumes, music, and performances. 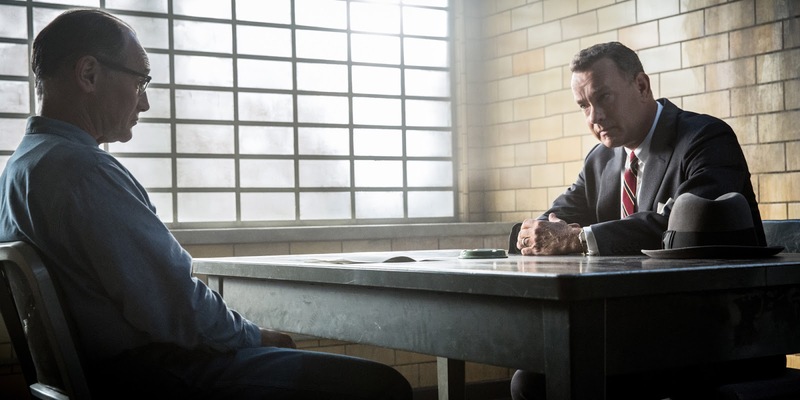 In this case, by the ever dependable Tom Hanks as a Brooklyn lawyer who negotiated the prisoner exchange of Francis Gary Powers and Colonel Abel in the 1960's. The U2 spy plane incident came during the Cold War when the East and the West were involved in intense espionage. When children in school were running through bomb drills and how to survive if the Russians attacked the U.S.. The country was immersed in a Communist paranoia making the Russians the boogie man sort of like how today some fear radical Islam. Hanks plays James B. Donovan a partner in a law firm that specialized in insurance cases. He graduated from Harvard Law and was an Justice assistance during the Nuremberg trials in Germany. It was one of the reasons why the FBI approached him to be the defense lawyer for Rudolf Abel (Mark Rylance) a quiet, mild mannered artist who was arrested as a Russian Spy. Besides the fact that no body wanted to do it. The government wanted to show the world that they were giving him the best of what the legal system allows, although everyone involved had already tried and judged him guilty. Donovan loses of course, but takes the case to the Supreme Court on appeal. They lose there too. He then urges the sentencing judge to not execute Abel, with whom he has grown to like on a personal level, just in case they need to use him as a prisoner exchange. The country was not happy with not killing the spy, and Donovan and his family were in the line of fire. Shortly afterwards the CIA approach Donovan to negotiate an exchange of Abel for Francis Gary Powers, a CIA pilot who was shot down in the T.O.P. secret U2 plane taking surveillance pictures. Powers had been instructed by the CIA to destroy the plane and inject himself with a poison. Unfortunately he doesn't get the chance and he's tried as a spy in Russia, sentenced to 30 years. Both governments use extreme measures to extract information from their “spies”. Both men are subjected to a strong disrespect by their country men for being caught. Donovan is asked to get Powers back because he's not government. That means going to East Germany which just erected the Berlin Wall in the middle of winter. He not only has to dance around the CIA's, the KBG, and the East Germans all wanting some agenda. Donovan learns of a young American student, Frederic Pryor who got caught behind the wall and being held without charges. He wants to include his release in the exchange. Hanks plays the forthright, honest, and level headed Donovan trying to do his best for his country and the men involved. He's smart and crafty managing to play a poker game with the possible scenarios setting up both the Russians and East Germans. It's interesting and exciting even is you know the outcome of this moment in history. While it's great to see biographies of really famous shapers of the world, it is also important to hear about the quiet unassuming workaday heroes that rise to the occasion.